The much-anticipated CaribFest Festival is once again upon us bringing to life its theme, “Excerpts of the Caribbean.” Harbor Park Norfolk will again be ablaze with the excitement of authentic Caribbean entertainment for the entire family. Calypso, Reggae, masquerade parade (Mardi Gras style), steelpan jamboree, savory Caribbean cuisine, arts & crafts and much much more. 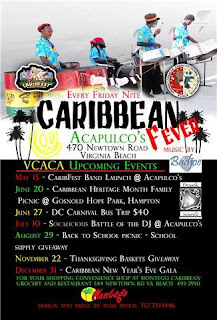 Friday August 14, 2009 - Steel Pan Jamboree and Calypso Competition - Come hear the Best in Caribbean Calypso and Steel Pan! Gates open from 6:00 p.m. to 10:00 p.m. bring your folding chairs. Saturday, August 15, 2009 - The fun continues with a Masquerade/Carnival parade along Waterside Drive beginning at Town Point Park at 1:00 p.m. and terminates at Harbor Park. At Harbor Park, Come out and see the best the Caribbean have to offer - there will be Live Performances (i.e. Calypso, Salsa, Soca, Zouk, and Folklore) from some of the biggest names in the Caribbean performing live on stage. Gates open from 11:00 a.m. to 10:00 p.m. Bring your folding chairs and umbrellas. The CaribFest Festival will appeal to the entire family. We have entertainment for the young (Kids Zone) and old alike. Bring out the kids and come enjoy the celebration of Caribbean Culture, Music, Food, and the spirit of Carnival all day long. We are also looking for vendors. Friday – Adults $10, kids 6-17 $5, and younger than 5 years is Free. Saturday – Adults $10, kids 6 to 17 $5, and younger than 5 years is Free. For further information and vending opportunities, visit our Web site at: www.virginiacaribfest.com , or contact Abby Mills at info@vcaca.org or ilengirl@msn.com 757.287.1539.